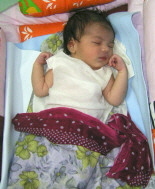 A girl was born to my sister Sangeetha on Friday, 12th February 2010 at about 4:44 pm, in Coimbatore. Sunil V Raman, my brother-in-law who flew back to India from UAE on 10th February 2010 was beside her at the time of delivery. Sangeetha and Sunil have Arjun as their first son who is studying in Coimbatore. Congratulations to Sangeetha & Sunil.